Can’t believe I managed to get here to update early this morning, its only a fluke as we have my nephew Senan’s christening this afternoon to attend to. I did manage to get in to see my niece this week, Roisín, and what a cutie she is and she was awake so I got a cuddle which is just priceless. Everything has been busy as normal this week with the normal running to and fro, we are settling into that and being this busy is just preparing me for December, I still don’t have much computer time but any spare time I do have I’m knitting with it so I’ve progress for you all. My stitching bug has still gone and I’m just hoping it shall return soon as the winter comes in but I won’t worry about it just yet. Last week, you’ll remember I had the Demne and Kimono blocking, well I got buttons sewn on both and little ties put in on the Kimono cardigan and here is how they are looking now. I’ve also put them with the sleepsuits I had gotten with these patterns in mind. Demne Cardigan all blocked and with buttons. 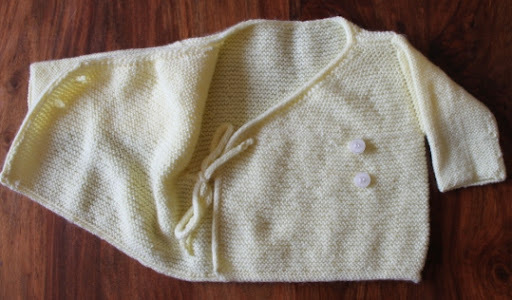 Demne Cardigan teemed with its sleepsuit. I also cast on a little sweater, the pattern of which came in a little booklet to go with a knitting magazine. I had found this 4ply white baby yarn in my stash and is perfect for it. Its knit all in one go and I’ve the front and front of the sleeves done and am now onto the back. This is what I will work on mainly for this coming week. With all the yarn that I had gotten last week I decided to cast on one of the hats that’s intended for Benjamin for Xmas. The pattern is Strib Hat. Its been knit in Benjamin’s favourite colour green and I’ve added a little light grey just for a bit of interest to it. I am hoping I’ve enough yarn to knit matching mittens left over. That’s all on and off the needles for this week. Knitting intentions this week are to get hopefully more done on the baby sweater and perhaps another Xmas hat or mittens done but we shall see what the week sends. This entry was posted in Uncategorized and tagged Baby Sweater, Demne, Garter Stitch Baby Kimono, Strib Hat. Bookmark the permalink. Wow, great work. You have been busy! Oh the little sets are ADORABLE! And truly, I had not thought of buying a sleeper and making a little sweater to go with it. 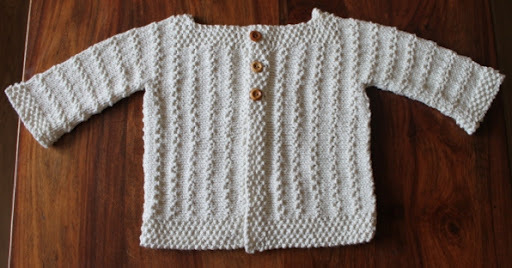 I will have to make a couple to keep on the side for baby shower gifts.yours are absolutely adorable! They look lovely after blocking; although I bet they were lovely before 🙂 How nice to match them up to a sleep suit to make a complete outfit! 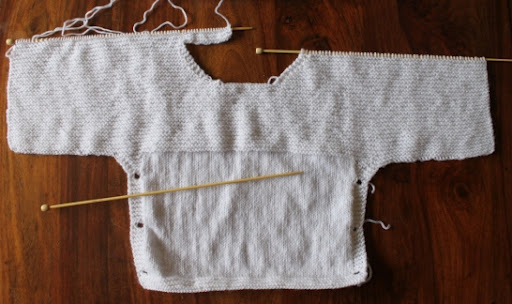 In my dreams I will knit as well as you someday…if I live that long! LOL! What beautiful items you make…every one of them looks perfect and gorgeous. Of course, I love the little baby items…so precious and Benjamin's hat I'm partial too since I have a Benjamin also…he has a bigger head though (literally and figuratively) as he is now 32….no more babies at my house. I love the grey you put with the green too. So glad to see you on here….I was gone last week and was hoping you'd be on this week! Hope you had a great time at the christening…what a special day. Have a great week! OMG you've been knitting day and night. You're suppose to get some rest you know when you're expecting, lol. Awesome sweaters. ❤ the names of your nephew and niece + ❤ the baby set! What a beautiful gift that makes. Such cate little baby stuff. I love the outfits you've put together!